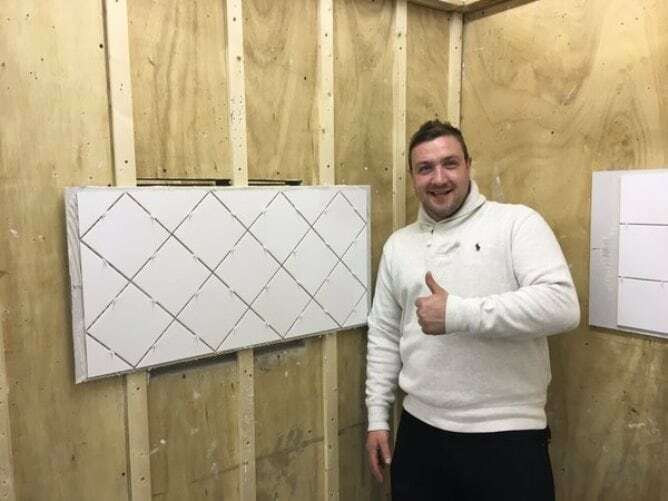 Staff from independent builders’ merchants Boys and Boden and plumbing merchants The Plumbline have got up to speed with the latest in tile adhesive and grout technology from Dunlop – the specialist manufacturer of tile adhesive, grouts, finishing and decorating products. Counter staff from the independent chain, which has branches across the Welsh Marches, took part in two days training at Dunlop’s state-of-the-art Innovation and Technology Cen tre (ITC) at its Stoke-on-Trent HQ. Led by Gareth Birks, Dunlop Technical Support Manager, the bespoke course included theoretical presentations and hands-on practical workshops on Dunlop tile adhesives, grouts and other tiling products including its new Pro Cover uncoupling mat system and Shower Waterproofing Kit. Gareth Birks added: “Training is a key priority at Dunlop, and we believe it is important to give merchants and their staff the opportunity to learn about our products and enhance their skills, which will ultimately give them the confidence to sell more effectively. Retailers have the option to pick and choose the modules that suit their requirements, ensuring that their training experience is tailored to meet their needs. On completion, all delegates will receive a selection of Dunlop merchandise. Debi Boulton, brand manager at Dunlop said: “Merchants should take advantage of these courses to give their staff the best opportunity to sell better, helping to increase margins and market share”.